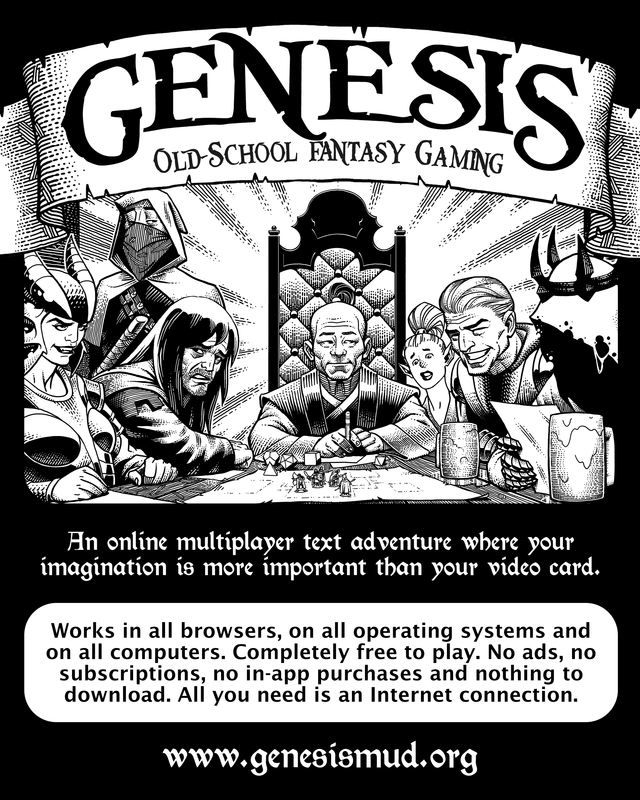 There are many ways that you can help to promote Genesis. Some require a bit of effort, but many are so easy there is no reason not to do them right away! The more people who participate in doing these things, the more players we will attract. 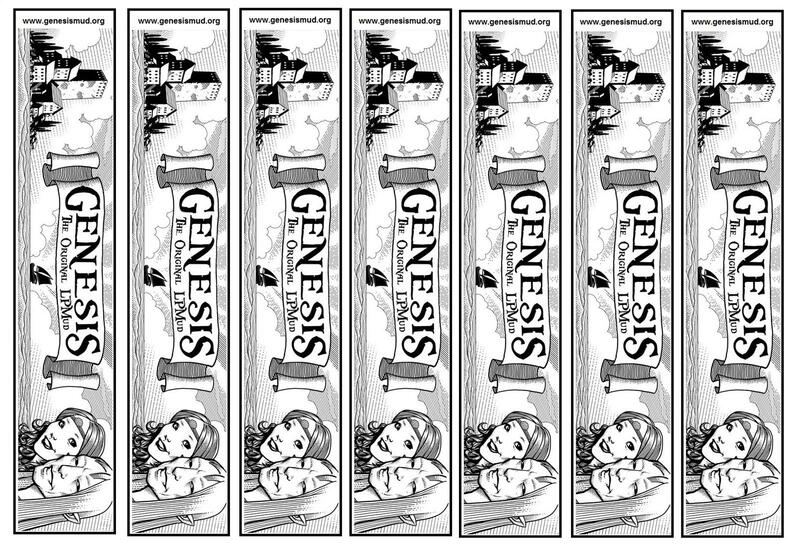 - Use the social media buttons on the bottom of this webpage to share Genesis with your friends. - Give us an awesome review and a 5-star rating on the Google Chrome Store. This helps us get a better ranking there, which helps A LOT in attracting new players. - Give us an awesome review and a 5-star rating on the Microsoft Store. While this store is not as popular as the Chrome store, good ratings and review still help. 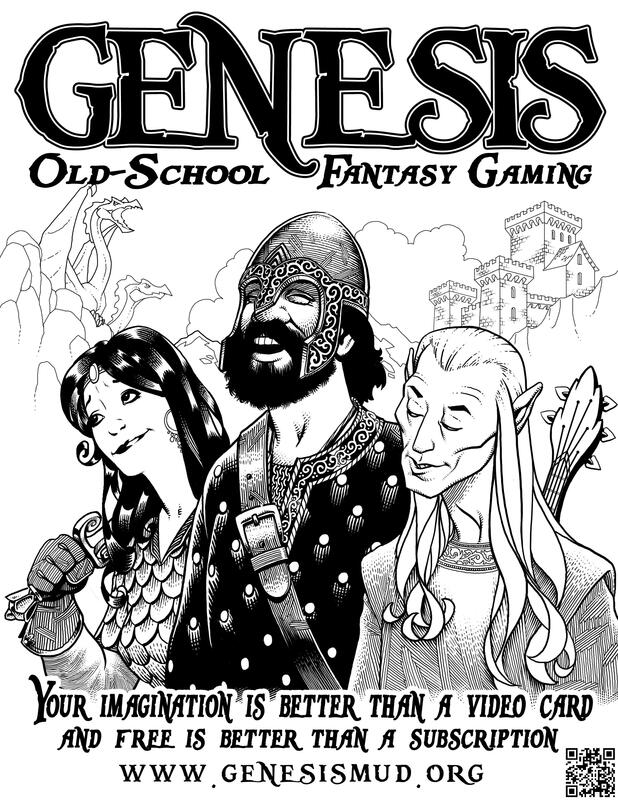 - Join and pariticpate in the discussions on the offical Forums and in the Genesis Facebook group. 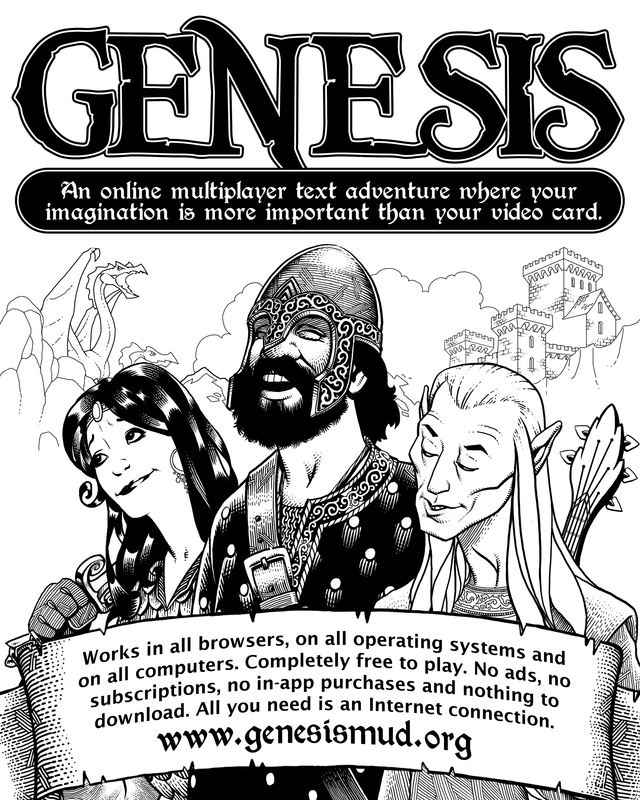 - Create a direct link to the Genesis homepage on any sites you are able to. - Use this this link to vote for Genesis on topmudsites.com. - Join the discussion about MUDs on Reddit, and let the people there know about Genesis. 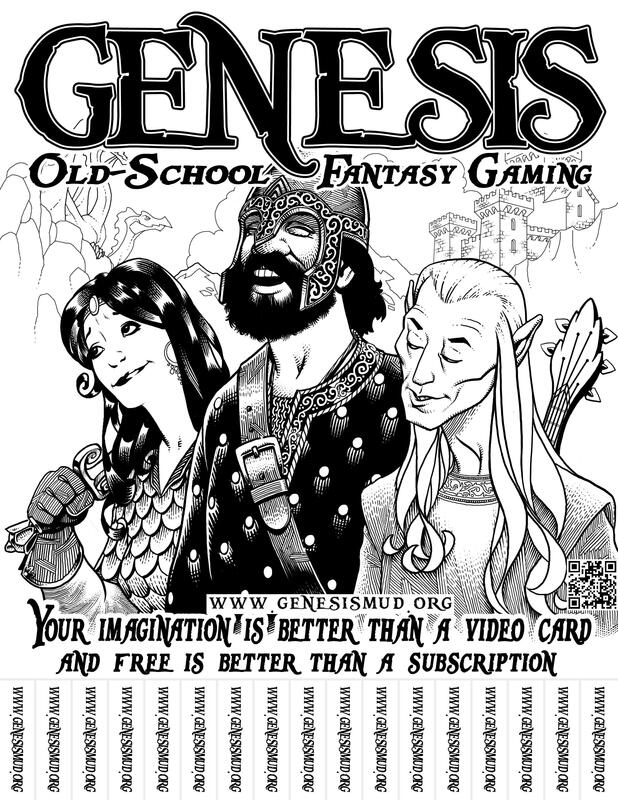 - Post the URL and talk about your enthusiasm for Genesis on any forums, blogs, or other types of web-hosted communities you are involved with. These things seem small, but if everyone does them, the compound effect can be very powerful, indeed. Take a minute and do as many of these things as you can. Genesis thanks you! We have developed materials that you can download and distribute in communities around your city or town. This is a great way to bring new people to the game! Intended for ongoing display in some location or to be given to an individual. Version of the above poster, but intended to be placed in a location where it is likely people will want to tear off a paper tab of the URL to take with them. High resolution 4x5 inch flyers that can be professionally printed, or simply printed on your home printer. Print these out on heavy cardstock, laminate if possible, cut into separate bookmarks, and place them in libraries, coffee shops, etc. 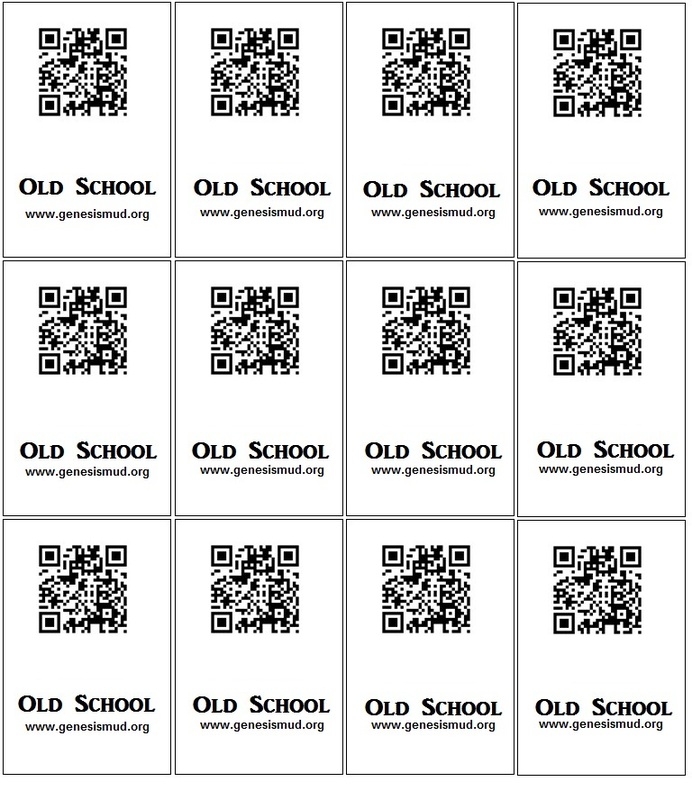 Print these out on medium cardstock, cut into separate cards, and distribute liberally to anyone who'll take 'em! Download the material you need and print them out using the best possible equipment at your disposal. If you have printed the tear-off-tabs poster, dont forget to prepare it by cutting along the lines with scissors. Distribute the materials you have printed and prepared in the best locations you can reach in your RL cities and towns. Go get 'em!